Last major update issued on May 29, 2012 at 05:40 UTC. 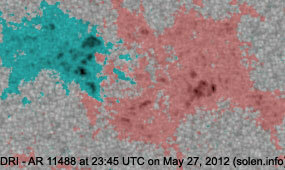 The geomagnetic field was quiet to unsettled on May 28. Solar wind speed at SOHO ranged between 346 and 410 km/s. A weak disturbance was observed arriving at ACE near noon. 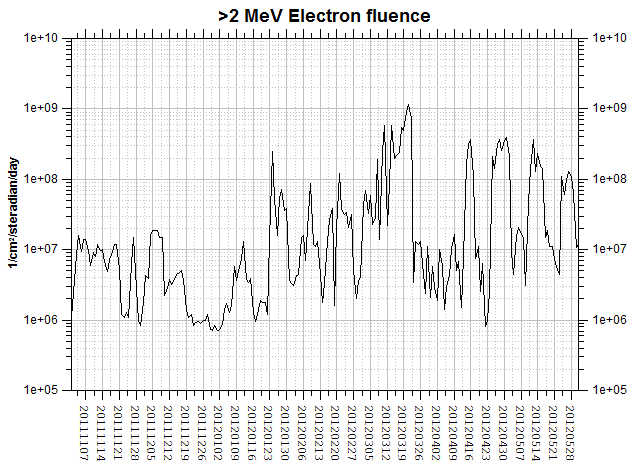 Solar flux measured at 20h UTC on 2.8 GHz was 110.3 (increasing 0.4 over the last solar rotation). 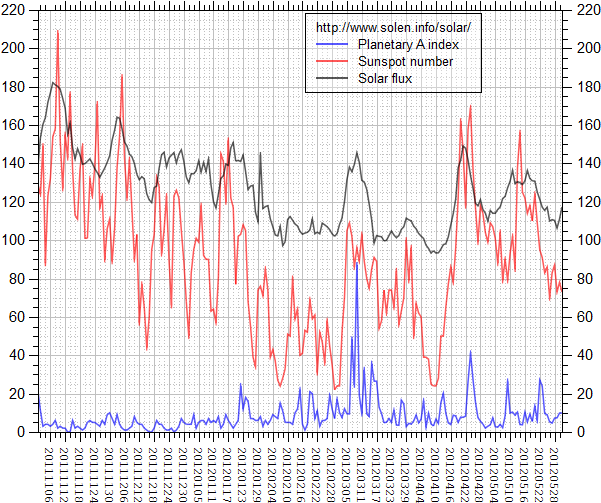 The Potsdam WDC planetary A index was 8 (STAR Ap - based on the mean of three hour interval ap indices: 7.8). 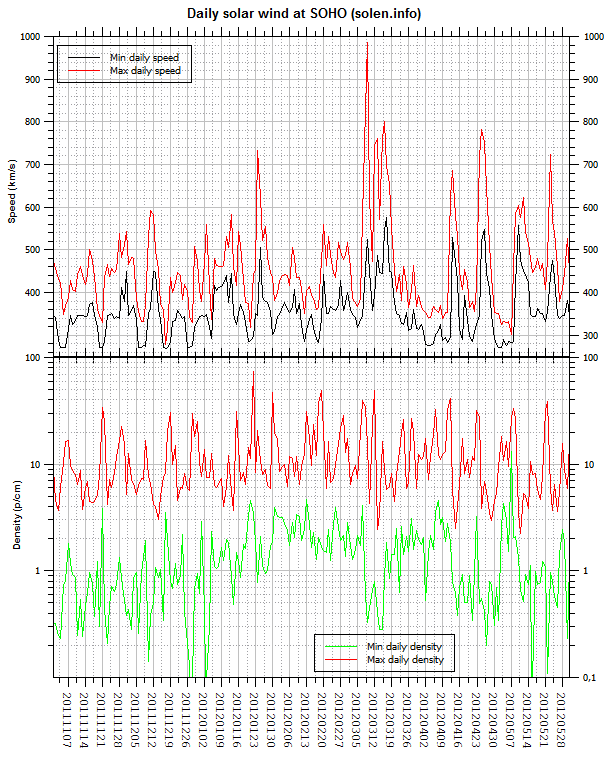 Three hour interval K indices: 11112332 (planetary), 01013322 (Boulder). Region 11486 [N17W65] was quiet and stable. 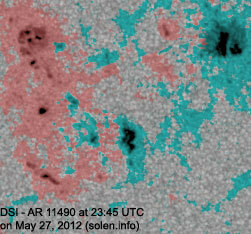 Region 11488 [N11W27] lost some spots and appears to be decaying. 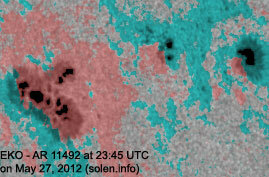 Region 11489 [S26W14] reemerged with a single tiny spot in the trailing polarity area. 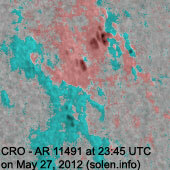 Region 11490 [S13E04] developed in the southern part while decay was observed in the northern part. Actually this could be two closely spaced regions. Region 11491 [N23W70] decayed slowly and quietly. Region 11492 [S13E33] decayed in the leading spot section while the trailing penumbra split into several smaller penumbrae. S1682 [S23E35] reemerged with a few tiny spots. S1686 [S18W14] decayed slowly and quietly. S1692 [S12E58] was quiet and stable. New region S1693 [S22E43] emerged with two spots. 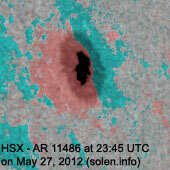 New region S1694 [N09E32] emerged with a tiny spot. 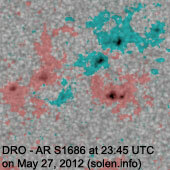 New region S1695 [S15W26] emerged with spots in an old plage area. May 26-27: No obviously Earth directed CMEs were observed in LASCO or STEREO imagery. 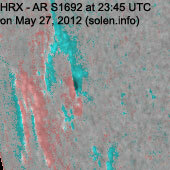 May 28: STEREO A and B imagery indicates a slow and long duration CME which could be Earth directed. Further analysis will be necessary. 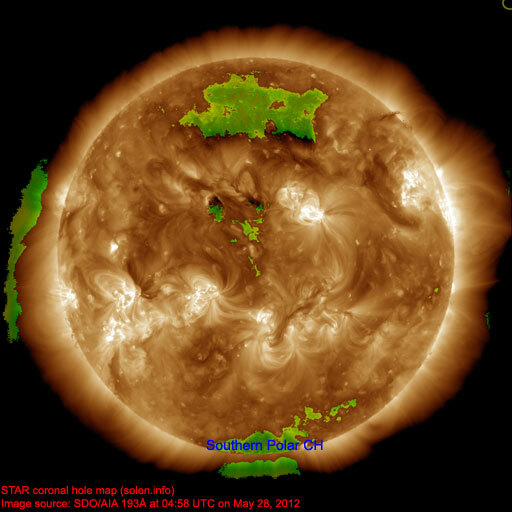 A recurrent northern hemisphere coronal hole (CH520) wil likely rotate into an Earth facing position on June 1-2. The geomagnetic field is expected to be mostly quiet on May 29-31.